Reach the right people, at the right time, with the right message using Facebook Ads. Our Facebook Advertising Service can introduce your brand to the right people who are ready to take action. Our team of experts can develop and design campaigns for the kinds of results you want. We can build a program that will work with your budget and goals. No matter what types of results you’re looking for, Facebook has plenty of advertising programs available, from video, image, and canvas ads to carousel, lead generation forms, and product ads, to help reach your intended audience. Pool Marketing Site’s Facebook Advertising Service can introduce your brand to the right people who are ready to take action. Our team of experts can develop and design campaigns for the kinds of results you want. Single Image Ads: Single images remain the gold standard of Facebook advertisers. A powerful image, when paired with a thoughtful message, can still drive plenty of traffic at an optimum cost-per-click. Video Ads: With 100 million hours of video viewed on Facebook every day, there is infinite potential to reach your audience with video. Carousel Ads: Incorporating 2 to 10 square-shaped cards allows users to scroll left-to-right through multiple products shots, images or videos. Each card can link to a different landing page, and you can choose to keep the cards in sequence or allow Facebook to serve the most clicked images first. Slideshow Ads: Facebook slideshow ads are video-like ads that use motion, sound and text to tell your story beautifully across devices and on every connection speed. Canvas Ads: When this single image or video unit is clicked, it overtakes the mobile user’s phone or tablet screen, immersing them into a multimedia experience that can include images, video, carousel, wallpaper, and much more. Brand Awareness. We’ll optimize for views to help you gain a foothold in your customer’s world. Facebook users will be able to engage by liking, leaving comments, and/or sharing ads with their network, exposing your brand message to more people. Get More Leads. Lead generation campaigns can seamlessly convert audiences to leads with only one click. Local Awareness. Need more foot traffic to your business? Local awareness ads target a radius from your location so that you can get the in-store visits you need to increase sales. Engagement. Reach as many people as possible and drive engagement with your ad. Create ads with a coupon, discount or other special deals. Increase Conversions. Encourage people to visit your business website and make a purchase. Messages. Start conversations that enable you to connect with customers and drive them from interest to purchase. 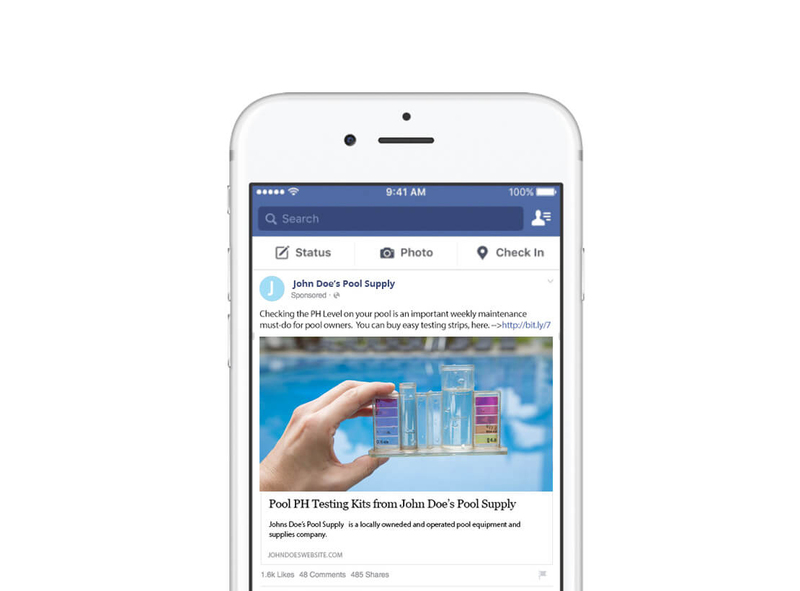 Establishing a strong social media presence on the world’s number one platform is critical – and it’s something The Pool Marketing Site’s Facebook Ads program is good at. Our targeted Facebook Ads have increased our clients’ Fans & Followers by up to 22%, and have had others seeing an over 1,700% increase in ad impressions, more than a 1,000% increase in lead submissions, and nearly 600% increase in post engagements!